I unsuccessfully tried to entice a publisher into a (PR positive) book give away. Sorry I wasn't more persuasive. 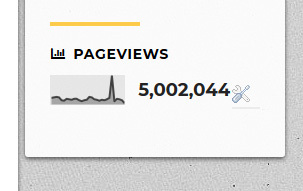 Can we find the actual 5,000,000th? I could probably rustle up a present (and doubtless Tommy has plenty of his books in a pile somewhere). If she or he can come and get the present I can offer a full box of The Epistle of Jude: Its Text and Transmission. My prophetic gift is confirmed. Had no idea when in exasperation I started blogging on Friday 14 October 2005 before a great evening meal at the Gathercoles'. That statement is definately not true! Pageviews ≠ visitors! Google Analytics "Pageviews" describes the number of page-clicks, that have been made by visitors - regardless the visitor has been on that site before or not. One example: If the actual pageview-count is 5.000.000 and a visitor clicks "ressources" and after that "Index of Variants Discussed in Relation to the CBGM"... then back to "Essential Books", three additional pageviews would have been created (5.000.003). If this person does exectly the same again some days later, again three additional pageviews would have been created (5.000.006). Maybe...what he wrote is "visitor". At least Peter Gurry would have known better, I guess. Regardless, this demonstrates the value of this blog to TC particularly, and Evangelical Christianity in general. Please keep up the great work! No doubt Dr Gurry would have known better. All the same, I'm pretty sure he would have read all the way to the small print note at the end of such an extensive post. A lot is being assumed in this thread. My comment was a--lame--attempt at a textual-critical joke seeking to deflect Anony's ire. Maybe better luck next time. Did Heraclitus say you can't visit the same wetblog twice?